Your day-by-day itinerary now includes Gouves Water Sports, Lyrarakis Winery, Cathedral of St. Minas, and other attractions you added. 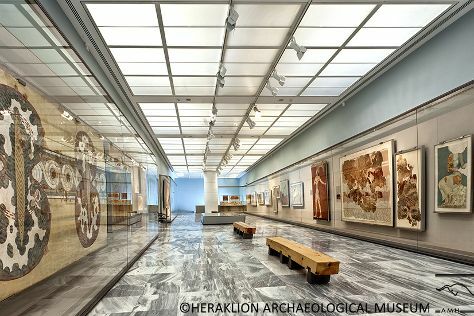 Get a sense of the local culture at Heraklion Archaeological Museum and The Natural History Museum of Crete. You'll visit kid-friendly attractions like The Palace of Knossos and Cretaquarium - Thalassocosmos. Take a break from Heraklion with a short trip to Kazantzakis Museum in Myrtia, about 32 minutes away. For ratings, reviews, photos, and tourist information, read Heraklion trip site . Tel Aviv, Israel to Heraklion is an approximately 5-hour combination of flight and bus. Traveling from Tel Aviv in April, plan for little chillier nights in Heraklion, with lows around 14°C. Wrap up your sightseeing on the 20th (Sat) early enough to drive to Hersonissos. Your day-by-day itinerary now includes Aquaworld Aquarium & Reptile Rescue Centre as well as Buggy Safari Motoxperience. 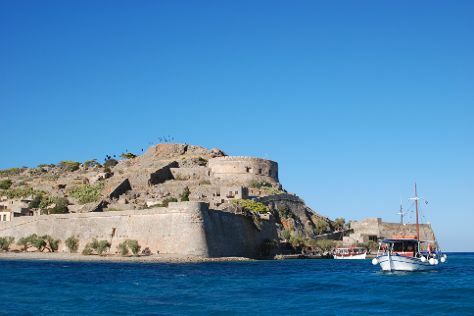 Start off your visit on the 20th (Sat): take a memorable tour with Buggy Safari Motoxperience, then admire nature's wide array of creatures at Aquaworld Aquarium & Reptile Rescue Centre, and then stroll through Fortress Spinalonga. For maps, traveler tips, photos, and more tourist information, go to the Hersonissos route planning website . Hersonissos is just a stone's throw from Heraklion. Expect little chillier evenings in Hersonissos when traveling from Heraklion in April, with lows around 11°C. You'll set off for Elafonissi on the 21st (Sun). Located just off Crete's southwestern corner, Elafonissi offers an alternative vacation idea for those looking to avoid the larger, more crowded Greek islands. Kick off your visit on the 21st (Sun): kick back and relax at Elafonissi Beach and then stroll through Elafonisi Viewpoint. To see photos, where to stay, more things to do, and more tourist information, read our Elafonissi trip app . Getting from Hersonissos to Elafonissi by shuttle takes about 3 hours. Other options: do a combination of shuttle and flight; or take a bus. In April, daily temperatures in Elafonissi can reach 24°C, while at night they dip to 14°C. You'll set off for Chania Town on the 23rd (Tue). On the 23rd (Tue), take an in-depth tour of Archaeological Museum of Chania and then brush up on your military savvy at Maritime Museum of Crete. For where to stay, traveler tips, and tourist information, use the Chania Town road trip planning site . Getting from Elafonissi to Chania Town by bus takes about 2 hours. In April in Chania Town, expect temperatures between 24°C during the day and 14°C at night. Wrap up your sightseeing on the 24th (Wed) to allow time to drive to Rethymnon. You've added The Venetian Fortezza, Margarites Gorge, Venetian Harbour, and other attractions to your itinerary. Kids will enjoy Balos Lagoon and Monastery of Arkadi. Go for a jaunt from Rethymnon to Sfakia to see Samaria Gorge National Park about 2h 15 min away. Next up on the itinerary: take a stroll through Rethymnon Old Town. To find more things to do, maps, where to stay, and tourist information, refer to the Rethymnon trip itinerary maker site . You can drive from Chania Town to Rethymnon in an hour. Alternatively, you can take a bus. In April, plan for daily highs up to 24°C, and evening lows to 14°C. Wrap up your sightseeing on the 27th (Sat) to allow time to travel back home.